Thanks to all for showing up! 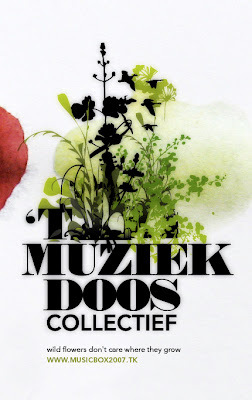 â€¢ Keep the muziekdoos spirit alive â€“ a place where there are instruments, amps, where everyone can come and play/jam/rehearse/experiment and maybe most importantly, meet likeminded people. â€¢ Convince people of the importance of this muziekdoos-spirit if we want to keep real honest music alive. A place-to-be for musicians, poÃ«ts and other creative minds and friends. Cross pollination at its best. â€¢ Organize larger events (mini festivals) on different locations where bands can perform and a free podium is available. Get festival promotors/sponsors involved. â€¢ Make a presentation that clearly outlines our plan and try to involve the culture department of Antwerp. â€¢ Search a VZW that wants to be involved in organising events for us. (Creating a VZW ourselves is not a good plan). â€¢ We also will continue to collect money with the mobiele muziekdoos to help Etienne to pay the state. This about rounds up what was discussed and what 'tmuziekdooscollectief stands for. Richmond, Virginia (Carytown): Limani Fish Grill announces the opening of its first ever exhibition, "Waiting..." on Sunday, February 19th. The exhibit features the artwork of Richmond's waitstaff/ bartenders/ kitchenstafff. Come feast your eyes and enjoy live music, hors d'oerves and a cash bar. Free and open to the public. is that the OCC tag I see on this poster?